The last time we posted the Microsoft Surface Pro release time. Today we got their formal launching time: Feb 09, 2013. Microsoft just announced that its Surface Pro tablet will go on sale February 9th in the US and Canada, with wide retail availability beyond just Microsoft.com and Microsoft Stores. As you may have already read, the device will start at $899 for the 64GB model, and $999 for the 128GB version. Whichever you choose, a pressure-sensitive pen comes in the box; the keyboard does not (that’ll be $120 or $130, depending on whether you get the Touch or Type Cover). 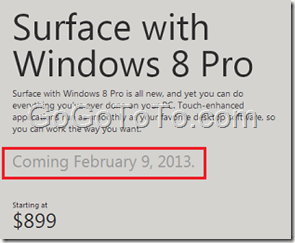 Surface Windows 8 Pro will join the Surface lineup on February 9, 2013. In the coming weeks, Surface Windows RT will be available in several new markets worldwide. And, watch for announcements about Limited Edition Touch Covers and the new Wedge Touch Mouse Surface Edition. Microsoft is making their own Windows Phone 8 ? Previous Previous post: Microsoft’s Big Event Today ?